10th July 2018 - BODIE 3.7 . you'll never walk alone ! 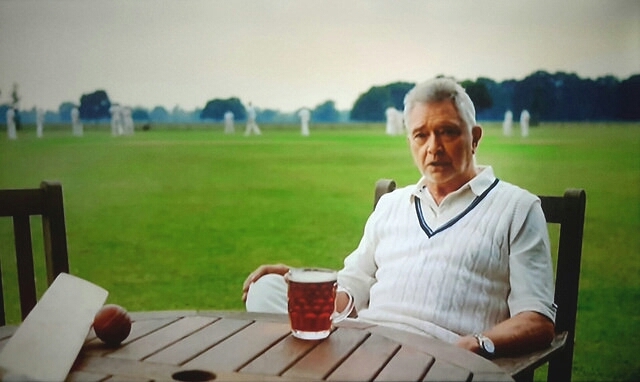 as soon as i saw the advert my brain went into Bodie mode with his cricket whites. I love your way of thinking and this could be older lads out on the cricket field. You are very welcome. This is Martin's current advertisement on tv which I managed to capture yesterday. I immediately thought of Bodie in his cricket whites. Yes he is advertising The Drama channel which inspector George Gently is screened on.You never know, someone may put it online at some point. I didn't know this was an ad - I thought it was from some TV series I haven't watched (there are loads) - what a wonderful 'Older Lads' vibe you've picked up here - especially as - unusually - it pictures an older Mr S as being clean shaven, just like a younger Mr D.
Need to go now - I'm only here because I overslept ! Very tired, but feeling quite a bit better now it's cooler. Thank you for your well wishes and I hope your rotten summer cold is on the way out. This cold is not for shifting and I hope you are feeling well. ha ha...perhaps he's only there to offer his support to bodie or maybe it's for the beer. Thankyou so much, glad that you like it. you are very welcome .....and i agree there is nothing quite like a glass of cold beer. Now that is a super photo. Thanks for posting it! you are very welcome and thankyou for looking at it....enjoy. yes, perhaps Doyle is supporting Bodie out on the cricket field. It was what i immediately thought of when i saw this advert with Martin. Love the idea that all these years later Bodie is still dragging Doyle to his cricket matches. But I'm sure there's a reward at home later.